1, Enhancing our cultural experiences: we cannot understand many modern movies – from Zorba the Greek to My Big Fat Greek Wedding or Captain Corelli’s Mandolin; modern literature – from Dostoevsky’s The Brothers Karamazov to the novels of Nikos Kazantzakis, the poems of Yiannis Ritsos or JD Salinger’s Franny and Zooey; or the music of composers like Rachmaninov and John Taverner, without an introduction to Orthodox piety, practice and spirituality. 2, The current world situation: Four EU member states have an Orthodox majority– Greece, Cyprus, Romania and Bulgaria. How did Orthodox spirituality sustain the people in Soviet Russia or in Ceausescu’s Romania? What was the role of faith in the horrors of ethnic cleansing in the former Yugoslavia? What form of spirituality is sustaining the people of Greece in their current economic and political crisis? Who are the Christians caught between the extremes of militant Zionism and militant Islam in the Middle East? Or, how should I behave when I visit a church while on holiday in Greece, Cyprus or Russia? 3, The current situation in Ireland: Orthodoxy may be the fastest growing Christian tradition in Ireland today. There are five Orthodox churches in Dublin, Greek, Russian, Romanian, Antiochene and Georgian, with the Romanians and the Russians using former Church of Ireland parish churches. In addition, from the Oriental Orthodox tradition, there are Indian Orthodox, Syrian Orthodox and Coptic Orthodox communities in Ireland. The Indian Orthodox Church worships in a Church of Ireland parish church. In addition, the Mar Thomas Church, which uses the Church of Ireland church in Tallaght, has its roots in Syrian and Indian Orthodoxy, and is in full communion with the Anglican Communion. 4, Orthodox spirituality offers many rich gifts and insights into worship, liturgy, spirituality and prayer. Indeed, Orthodox insights on prayer and spirituality have enriched many Anglicans, including Archbishop Michael Ramsey and Archbishop Rowan Williams, and many Anglicans have been helped to pray through the books of Metropolitan Anthony Bloom. I have been privileged to spend time in many Orthodox countries, experiencing the worship and prayer life of churches and monasteries in Greece, Romania, Cyprus and Egypt, especially on Mount Athos, Mount Sinai, Patmos, Thessaloniki, Crete, Samos and the Western Desert in Egypt. However, there are some specific aspects of Orthodox spirituality that I want to touch on briefly this morning: the Liturgy; Daily and Personal Prayer; Icons and Prayer; the Jesus Prayer; and the monastic life. The first experience many have of Orthodox prayer, worship and spirituality is as a visitor to an Orthodox church. That first experience of the Orthodox liturgy can be so overpowering that many people agree with the envoys from Kiev who said: “This we know, that God dwells there among humans.” But Orthodox liturgy has had an immense influence on the western liturgical movement, reforming and transforming, for example, our understandings of the separate Services of the Word and of the Sacrament, the Gospel procession, the ἐπίκλησις (epiklesis) in the Eucharist, even the fact that we stand far more often during the liturgy. The word Orthodoxy means, primarily, not right doctrine but right worship or praise, and doctrine is understood first and foremost within the context and setting of divine worship. We use the word liturgy loosely, meaning all the public offices of the Church. But in Orthodox theology, the Divine Liturgy refers only to the Eucharist. Although the Liturgy may be celebrated on most days, there is no tradition of a daily celebration in parish churches, and the Divine Liturgy is not celebrated on weekdays in the penitential season of Great Lent. The sense of worshipping the Lord in the beauty of holiness is experienced in the singing and in the decoration of churches, with their frescoes and icons. The singing is often a capella, and generally there is a noticeable lack of seating or pews (Canon 20 of the first Ecumenical Council of Nicaea in the year 325 forbids all kneeling on Sundays). There is a mixture of formality and familiarity that is particular to Orthodox participation in worship, for the worshipper knows he/she is in the house of their true Father. The church and the liturgy are truly meeting points between heaven and earth. ● The Hours (1st at 7 a.m., 3rd at 9 a.m., 6th at noon, and 9th at 3 p.m.). These services sanctify those times of the day. They consist mainly of readings from the Psalms and prayers, with the Psalms arranged so the entire Psalter is read over a week, and twice a week during Great Lent. Alongside the public prayer of the daily offices and the Liturgy, Orthodox Christians are taught that their daily prayer should include Morning, Midday and Evening prayers. Personal prayer in the home often includes morning and evening prayer, usually before the family icons, with either the whole family or individuals praying on their own. When they pray on their own, they are still praying with the Church. The icon of Christ in this chapel is a copy of the earliest surviving icon of Christ, from Saint Catherine’s Monastery on Mount Sinai. There are four smaller icons in the sacristy: Christ the Pantocrator; Saint John the Theologian in the cave on Patmos, dictating the opening verses of the Book of Revelation to Prochorus; an icon of the Last Supper; and a modern icon of the Supper at Emmaus; as well as a larger icon of the Day of Pentecost. For the Orthodox, the church building, the whole edifice, is one great icon of the Kingdom of God. 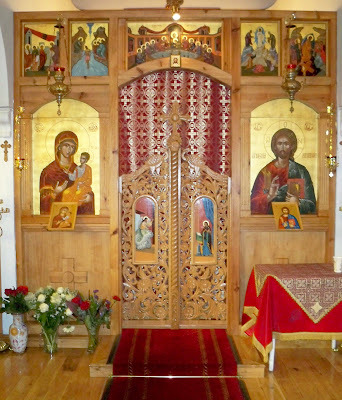 The frescoes, the icons and the icon screen (εἰκονοστάσι, iconostásis) separating the congregation from the sacred mysteries behind the royal doors are not to make the church look more pretty or beautiful, but are central to understanding Orthodox worship and life, liturgy and prayers. The dispute over the doctrinal orthodoxy of icons and their place in the Church was settled at the seventh Ecumenical Council in 843. Icons are part of the heritage of the undivided Church before the Great Schism. Their use has increased among Anglicans in recent decades, although some Anglicans treat them as decorative religious items rather than aids to prayer, while others raise questions about idolatry or, at the least, about an emphasis on things seen rather than faith. 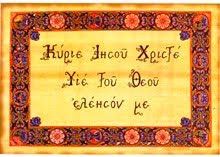 The word εἰκών simply means a depiction, image or representation. The New Testament describes Jesus as the eikon or the image and exact representation of God (Hebrews 1: 3). The Ecumenical Councils declared the incarnation had made it permissible to represent God in visual form. If Christ himself made God visible, then visual theology was as authentic as verbal theology. But the Orthodox say that an icon is written rather than painted, and speak of icon writers rather than icon painters, and carved or graven images are still unacceptable. Icons used in the Liturgy and in prayer are no more worshipped than the pages, ink and typeface of a prayer book, so that the Orthodox pray through but not to an icon, and while an icon is given reverence it is never worshipped. Large icons can be found on the walls of churches and icon-style frescoes usually cover the inside walls. They begin with more worldly scenes at ground level, and work their way up through the Gospel stories and the stories of salvation. In this way, as we are distracted by worldly thoughts during the Liturgy, we are called back to the purpose of worship, until our eyes are drawn ever upwards, and in the height of the dome we see the evangelists and angels surrounding the highest and holiest of all, Christ the Pantocrator, the one who rules all and through whom all things are made. Orthodox homes also have icons on the wall, usually on an east-facing wall in a place where the family can pray together, illuminated by a candle or oil lamp. Besides the practical purpose of making icons visible in an otherwise dark church, both candles and oil lamps symbolise that Christ is the Light of the World. The use of the Jesus Prayer is the subject of the Russian classic, The Way of a Pilgrim, which became familiar to many western readers in JD Salinger’s 1960s novel, Franney and Zooey. The Russian pilgrim in The Way of a Pilgrim discovers the Jesus Prayer and the answers to many of his questions in the Philokalia. With the Scriptures and the Philokalia in his hand, he places himself under the guidance of an experienced elder and begins his life-long struggle to develop inner prayer. In its simplicity, the Jesus Prayer is rooted in Scripture, echoing the cry for mercy of the blind man near Jericho (Luke 18: 38), of the ten lepers (Luke 17: 13), of the publican in the Temple (Luke 18: 14), and of the penitent thief on the cross (Luke 23: 42). Let us listen to a similar theme in The Cry of the Thief Crucified by the Russian composer Pavel Grigorievich Chesnokov (1877-1944), who suffered greatly under Stalin – when the Cathedral of Christ the Saviour, where he was the last choirmaster, was torn down, he stopped writing altogether. The tenor singing here is the Russian Evgeny Akimov (1910-1949). Play: The Cry of the Thief Crucified by Chesnokov (Track 13, Authentic Russian Sacred Music). The Jesus Prayer is a way of taking one of the most important first steps on the spiritual journey: recognising my own sinfulness, my estrangement from both God and the people around me. The Jesus Prayer is a prayer in which I admit my desperate need of my Saviour. For “if we say we have no sin in us, we are deceiving ourselves and refusing to admit the truth” (I John 1: 8). Saint Theophan the Recluse (1815-1894) was one of the greatest Russian spiritual writers. A persistent theme in his writing is developing an interior life of continuous prayer, learning to “pray without ceasing” (I Thessalonians 5: 17), as the Apostle Paul teaches in his First Letter to the Thessalonians – which we finish reading from in the Lectionary cycle in our Liturgy later this morning (I Thessalonians 5: 1-11). 3, The third and final level is prayer of the heart. At that stage, prayer is no longer what we do but who we are. It is a return to the Father through Christ in the Holy Spirit, which is the purpose of all Christian spirituality; it is to be open to the presence of the Kingdom in our midst. The author of The Way of the Pilgrim says the Jesus Prayer has two transfiguring effects on his vision of the world. Monks often pray this prayer many hundreds of times each night in private in their cells. Under the guidance of an Elder (Russian стáрец, starets; Greek γέροντας, gérontas), the monk aims to internalise the prayer, so that he is praying unceasingly, answering that exhortation from Apostle Paul to “pray without ceasing” (I Thessalonians 5: 17). When it is practised on a continuing basis, the Jesus Prayer becomes automatic. 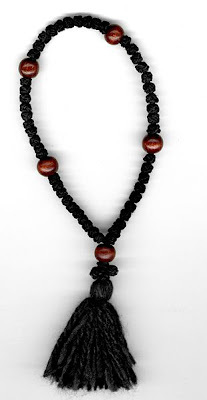 It is prayed repeatedly, often with the aid of a prayer rope (Greek: κομποσκοίνι, komboskíni), sometimes accompanied by the sign of the cross and even prostrations. In the practice of the Jesus Prayer, there is an emphasis on humility, with countless warnings about the disaster that befalls those who use it in pride, arrogance or conceit. There are warnings that seeking after unusual “spiritual” experiences can cause great harm, ruining the soul and the mind of the seeker. Seeking after “spiritual” experiences can lead to spiritual delusion, where a person believes himself or herself to be a saint, or has hallucinations in which he or she “sees” angels, Christ, etc. This state of spiritual delusion can be a pleasure in a superficial or egotistical way, but can lead to madness and suicide. In many texts, it is also said that that the Jesus Prayer must only be prayed by members of the Orthodox Church in good standing. 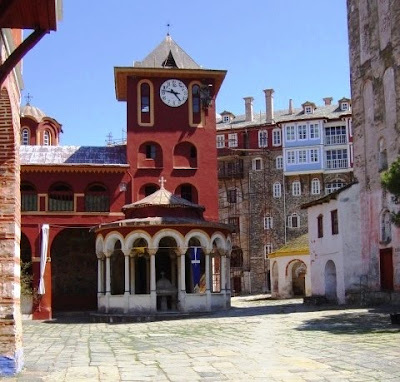 Mount Athos is the most important centre of monastic life in the Orthodox world today. There has been a recent revival in the fortunes of many of the monasteries on the Holy Mountain, with new monks arriving from Cyprus, Romania, Russia and Australia. The mountain is loved among the Orthodox for nurturing great writers in spirituality and on the life of prayer. Three of the best known of these writers in the 20th century were Saint Silouan (1866-1938), his disciple Archimandrite Sophrony Sakharov (1896-1993), founder of Saint John’s Monastery, which I visit each year, and Elder Joseph (died 1959). Although some of these great writers also lived as hermits, they gathered many followers, and were particularly known for their practice of the Jesus Prayer. In our quiet time, may I suggest some thoughts or reflections for consideration? ● Read through the lyrics of the hymn, O worship the Lord in the beauty of holiness (Church Hymnal # 196). This hymn was written Canon by John Samuel Bewley Monsell (1811-1875) of the Church of Ireland. How or where do you find the “beauty of holiness” in worship and liturgy? 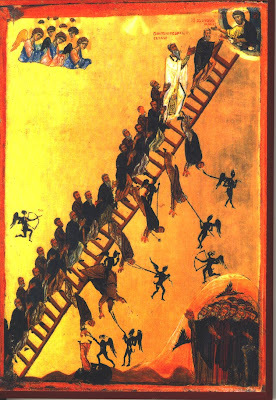 ● Borrow one of the icons I have been handing around, or one the icons I have left in the Sacristy, and consider your own possibilities of using them for meditation, or reflect honestly on your own difficulties about using icons. ● Reflect on your own engagement with immigrants. ● Reflect on how and why you visit or do not visit other churches during your time on holidays abroad. ● Or stay here in the chapel in silence, while I leave some Orthodox liturgical music on in the background to help your meditation. To pray truly, we can learn from the traditions of others. There are rich treasures in each and every Christian tradition that we can draw on without compromising our own Christian tradition, experience and spirituality. The beauty of the Orthodox liturgy, the insights provided by Orthodox use of icons, the practice of the Jesus Prayer, and the rich treasurers in the writings of Orthodox monks can help each of us to develop our own practice of prayer. Our closing music is the opening of the Liturgy, sung in Greek by a Romanian Orthodox choir. The call to worship begins with the sounding of the semandron or long wooden bar and the monastic bells calling people to prayer. Then the call to prayer includes the Δóξα (Doxology), the call to open the Doors of Penitence (Της μετανοíας), and the prayer, Come, let us behold (Δεύτε ίδωμεν την ζωην). As the music continues, feel free to leave the chapel in silence at your own pace and time. (Bishop) Hilarion Alfeyev, The Mystery of Faith (London: Darton, Longman & Todd, 2002, ISBN: 0-232-52472-6) ... written as an introduction for English-readers to Orthodox theology. (Archbishop) Anthony Bloom, Living Prayer (London Libra, various editions 1966-1971) … may be out of print now, but worth looking for in libraries. (Archbishop) Anthony Bloom, School for Prayer (London Libra, various editions 1970-1972) … again, may be out of print now, but worth looking for in libraries. (Archbishop) Anthony Bloom and Georges LeFebvre, Courage to Pray (London: Darton Longman & Todd Libra, various editions 1973-1974) … once again, may be out of print now, but once again worth looking for in libraries. 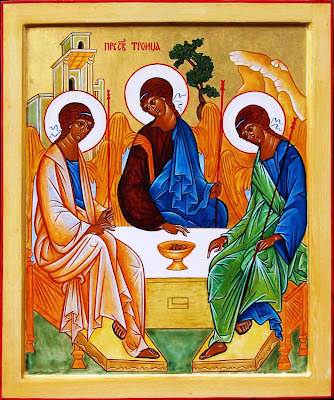 (Metropolitan) Anthony (Bloom) of Sourozh, The Living Body of Christ (London: Darton, Longman and Todd, 2008) ... a series of talks and interviews about what we mean when we speak of the Church, and in which he speaks of the Church as an icon of the Holy Trinity. Sergius Bulgakov, The Lamb of God (Grand Rapids/Cambridge: Eerdmans, 2008) ... one of the most remarkable books on Christology of the 20th century. The Divine Liturgy of our father among the saints John Chrysostom (Chipping Norton, Oxfordshire: Nigel Lynn, 2011, on behalf of the Greek Orthodox Archdiocese of Thyateira and Great Britain) ... a revised and updated version of the simple bilingual (Greek-English) presentation of the main Orthodox liturgical texts and prayers. E Kadloubovsky and GEH Palmer, Writings from the Philokalia on Prayer of the Heart (London: Faber and Faber, 1992, ISBN: 0-571-16393-9) ... access through the English language to selections from the major Orthodox work on spirituality. John Anthony McGuckin, Standing in God’s Holy Fire: the Byzantine Tradition (London: Darton, Longman and Todd, 2001) ... a vivid introduction to the leading figures, key themes and values by a priest of the Romanian Orthodox Church and church historian (part of the Traditions of Christian Spirituality Series). Frederica Mathews-Green, Fracing East: a pilgrim’s journey into the mysteries of Orthodoxy (San Francisco: HarperSanFrancisco, 2006) ... the journey of an evangelical family, described by a well-known author and blogger. Charles Miller, The Gift of the World, an introduction to the theology of Dumitru Staniloae (Edinburgh: T&T Clark, 2000, ISBN: 0-567-08732-8) ... an English-language introduction to the Romanian Orthodox theologian whose stature has been compared to Barth, Rahner and Schillebeeckx. Solrunn Nes, The Mystical Language of Icons (Norwich: Canterbury Press, 2004, ISBN 1-85311-657-2) … lavishly illustrated, beautiful thoughts as well as images. Nicholas V. Sakharov, I love, therefore I am (Crestwood NY: St Vladimir’s, 2002) ... deep insights into one of the great, influential spiritual fathers of Orthodoxy. Deborah Sheldon, Gospel Icons (Cambridge: Grove Books, 1999, ISBN 1-85174-401-0) … Grove Spirituality Series S 69, addresses many evangelical questions about the “orthodoxy” of icons. Graham Speake, Mount Athos: Renewal in Paradise (New Haven and London: Yale University Press, 2002) ...a guide to life on Mount Athos by a regular visitor. (Metropolitan) Kallistos Ware (Timothy Ware), The Orthodox Church (London: Penguin, 1997, new ed, ISBN: 0-14-014656-3) … the standard introduction in plain English to the Orthodox Church … covers history, liturgy, church calendar, theology, &c.
(Metropolitan) Kallistos Ware, The Orthodox Way (Crestwood, NY: St Vladimir’s Seminary Press, 2002, ISBN 0-913836-58-3) … a good general introduction to Orthodox doctrine, worship and life. Canon Patrick Comerford is Lecturer in Anglicanism and Liturgy, the Church of Ireland Theological Institute, and a canon of Christ Church Cathedral, Dublin. This lecture was delivered in the institute chapel on Sunday 13 November 2011 as part of the “Spirituality” lecture series with part-time MTh students.